1When Jesus had finished saying all this in the hearing of the people, he entered Capernaum. 2There a centurion's servant, whom his master valued highly, was sick and about to die. 3The centurion heard of Jesus and sent some elders of the Jews to him, asking him to come and heal his servant. 4When they came to Jesus, they pleaded earnestly with him, "This man deserves to have you do this, 5because he loves our nation and has built our synagogue." 6So Jesus went with them. He was not far from the house when the centurion sent friends to say to him: "Lord, don't trouble yourself, for I do not deserve to have you come under my roof. 7That is why I did not even consider myself worthy to come to you. But say the word, and my servant will be healed. 8For I myself am a man under authority, with soldiers under me. I tell this one, 'Go,' and he goes; and that one, 'Come,' and he comes. I say to my servant, 'Do this,' and he does it." 9When Jesus heard this, he was amazed at him, and turning to the crowd following him, he said, "I tell you, I have not found such great faith even in Israel." 10Then the men who had been sent returned to the house and found the servant well. 11Soon afterward, Jesus went to a town called Nain, and his disciples and a large crowd went along with him. 12As he approached the town gate, a dead person was being carried out—the only son of his mother, and she was a widow. And a large crowd from the town was with her. 13When the Lord saw her, his heart went out to her and he said, "Don't cry." 14Then he went up and touched the coffin, and those carrying it stood still. He said, "Young man, I say to you, get up!" 15The dead man sat up and began to talk, and Jesus gave him back to his mother. 16They were all filled with awe and praised God. "A great prophet has appeared among us," they said. "God has come to help his people." 17This news about Jesus spread throughout Judea and the surrounding country. 18John's disciples told him about all these things. Calling two of them, 19he sent them to the Lord to ask, "Are you the one who was to come, or should we expect someone else?" 20When the men came to Jesus, they said, "John the Baptist sent us to you to ask, 'Are you the one who was to come, or should we expect someone else?' "
21At that very time Jesus cured many who had diseases, sicknesses and evil spirits, and gave sight to many who were blind. 22So he replied to the messengers, "Go back and report to John what you have seen and heard: The blind receive sight, the lame walk, those who have leprosy are cured, the deaf hear, the dead are raised, and the good news is preached to the poor. 23Blessed is the man who does not fall away on account of me." " 'I will send my messenger ahead of you, who will prepare your way before you.' 28I tell you, among those born of women there is no one greater than John; yet the one who is least in the kingdom of God is greater than he." " 'We played the flute for you, and you did not dance; we sang a dirge, and you did not cry.' 33For John the Baptist came neither eating bread nor drinking wine, and you say, 'He has a demon.' 34The Son of Man came eating and drinking, and you say, 'Here is a glutton and a drunkard, a friend of tax collectors and "sinners." ' 35But wisdom is proved right by all her children." 36Now one of the Pharisees invited Jesus to have dinner with him, so he went to the Pharisee's house and reclined at the table. 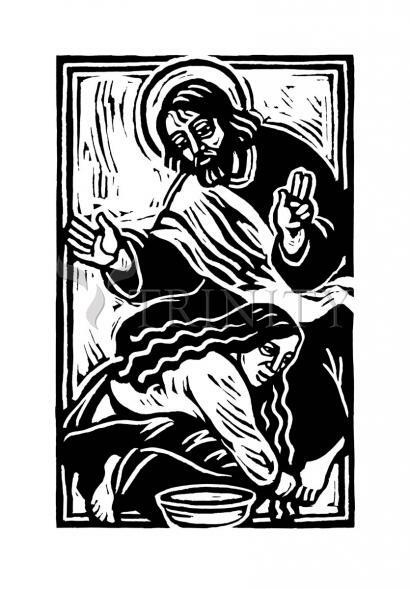 37When a woman who had lived a sinful life in that town learned that Jesus was eating at the Pharisee's house, she brought an alabaster jar of perfume, 38and as she stood behind him at his feet weeping, she began to wet his feet with her tears. Then she wiped them with her hair, kissed them and poured perfume on them. 40Jesus answered him, "Simon, I have something to tell you." "Tell me, teacher," he said. 43Simon replied, "I suppose the one who had the bigger debt canceled." "You have judged correctly," Jesus said.